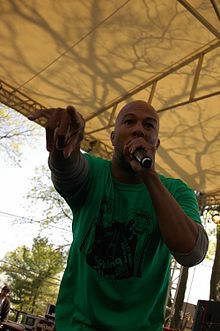 Common (formerly Common Sense, born Lonnie Rashid Lynn, Jr. on March 13, 1972, in Chicago, Illinois) is a Chicago-based hip hop artist. Whether you say "in Jesus name" or "Al hum du'Allah"
Never looking back, or too far in front of me. The present is a gift, and I just wanna be. After searching the world, on the inside what was hidden? Yeah, you know how we do, we do it for the people." From the documentary Holistic Wellness for the Hip-Hop Generation (2003); as quoted in "Common, Sticman, Badu Featured In New Health Documentary", AllHipHop (13 August 2003). I went to the movies — it was Kanye, myself and John Mayer, and we went to see "Ray." We were watching it, and I was just inspired by the movie, just as a musician and as an artist, I felt inspired. We left there and went straight to the studio. Kanye started cooking up this beat and started doing this chant, like, "Go, go, go," and while we were sitting there thinking what to write, John Mayer said, "You could write about your fantasy." And I was like, "Am I going to let John Mayer come up with the concept for this joint? This is hip-hop." But John Mayer is a very talented brother and you don't know where your blessings are going to come from. He was singing, and we made him a sample on it, going 'Go.' So it all came together and now we have the song 'Go!,' which is about going to my fantasy. Recently, John and I got to go to Selma and perform “Glory” on the same bridge that Dr. King and the people of the civil rights movement marched on 50 years ago. This bridge was once a landmark of a divided nation, but now is a symbol for change. The spirit of this bridge transcends race, gender, religion, sexual orientation, and social status. The spirit of this bridge connects the kid from the South Side of Chicago, dreaming of a better life, to those in France standing up for their freedom of expression, to the people in Hong Kong protesting for democracy. This bridge was built on hope, welded with compassion, and elevated by love for all human beings. The 87th Oscars ceremony, 22 February, 2015.